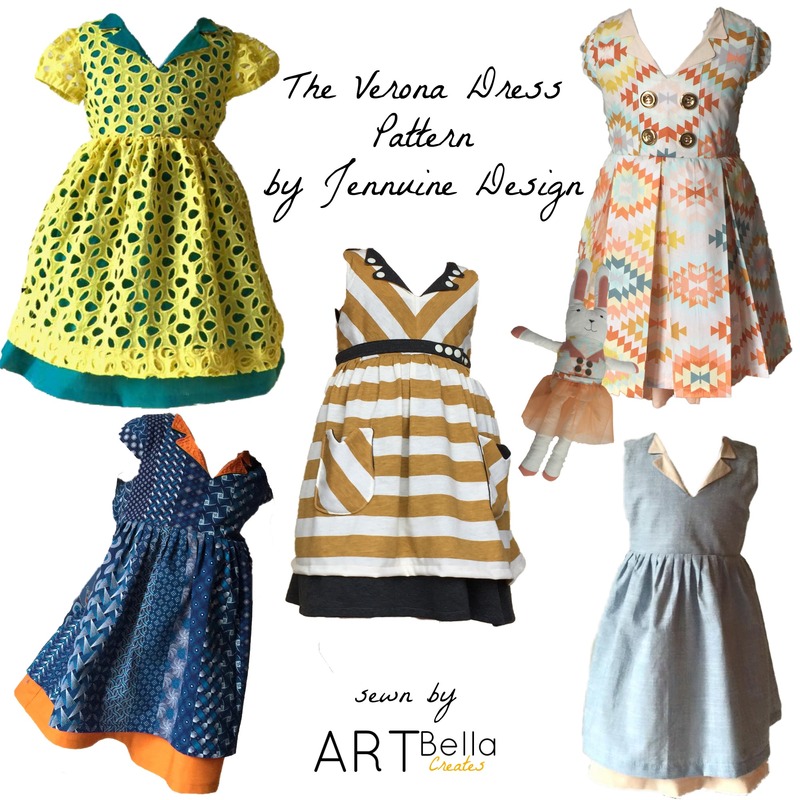 I am very excited to join Jenn from A Jennuine Life for the blog tour of her newest Pattern the Verona Dress. The pattern is currently on sale for $7.50 and you can get it HERE. I was very excited when Jenn included me in the test for The Verona Dress. I have been following Jenn since I started reading Blogs a couple of years ago. I have also sewed a couple of the Dressage Leggings HERE and HERE so I already knew that I was in for a treat. All of Jenn’s patterns are very well explained with illustrations and Step-by-step instructions. 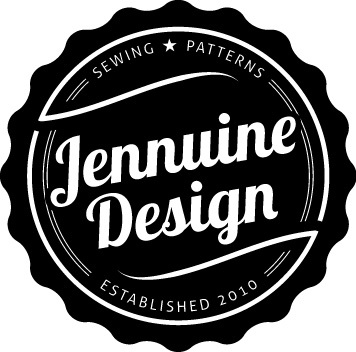 Jenn is always available for help which makes her a great pattern designer. 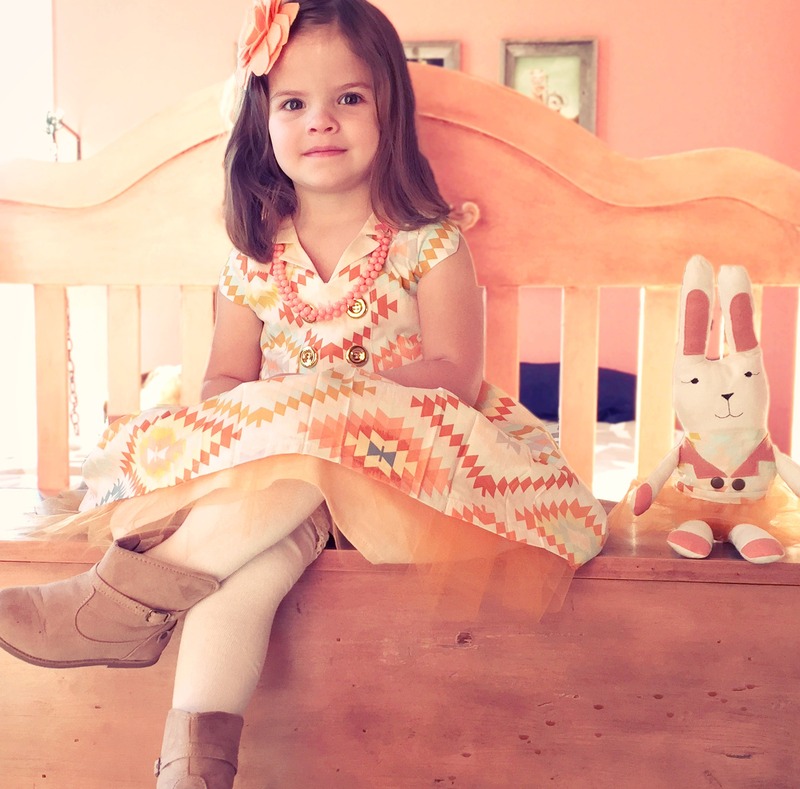 Isabella and I loved it so much I ended up sewing 4 versions in the 2 weeks of testing and another one last week to complete Easter outfits. 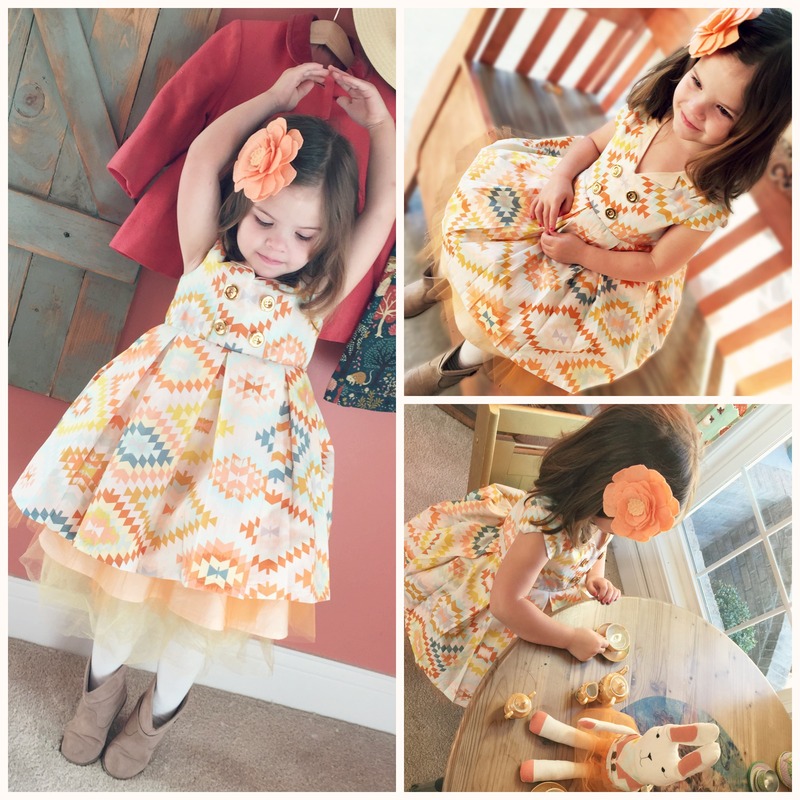 The Verona Dress is available for sizes 0 – 12 years. 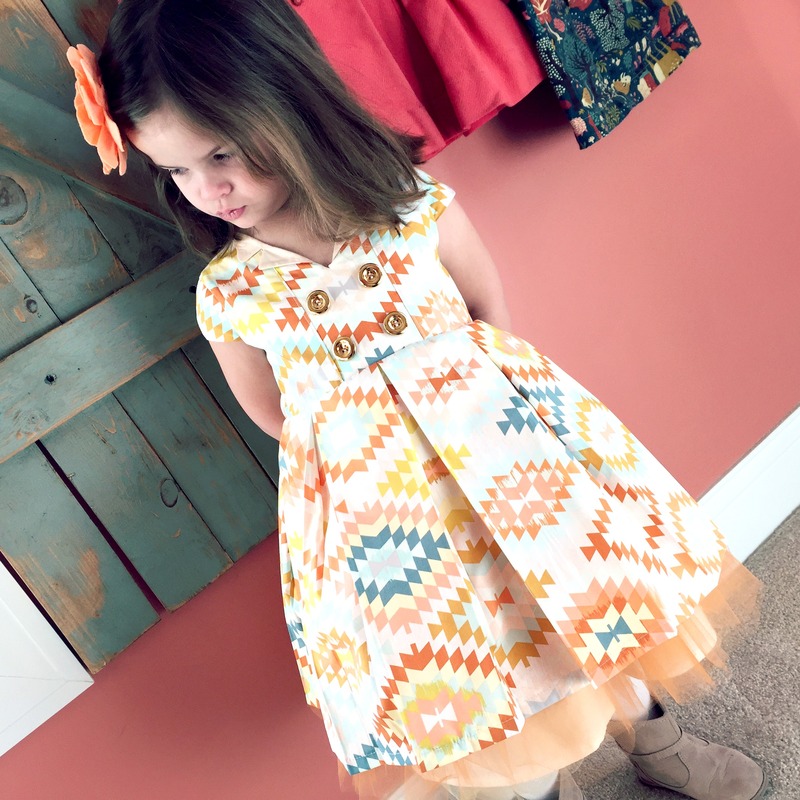 Unique characteristics of the Verona is that there are no button closures/zippers ( the baby sizes have a button in the back so it is very easy to get the dress over a baby’s head) and the beautiful fold back collar with a notch on the back neck line. On top of that there are lots of options – Long sleeve, short sleeve, cap sleeve and sleeveless. You can add pockets and/or Tulle. It is also fully lined with the lining peeking out from underneath the top skirt. The middle back has an elastic that makes for a beautiful and comfortable fit. I have tried them all except the long sleeve just because I am done with winter and want to sew nothing that makes me think of it 🙂 . 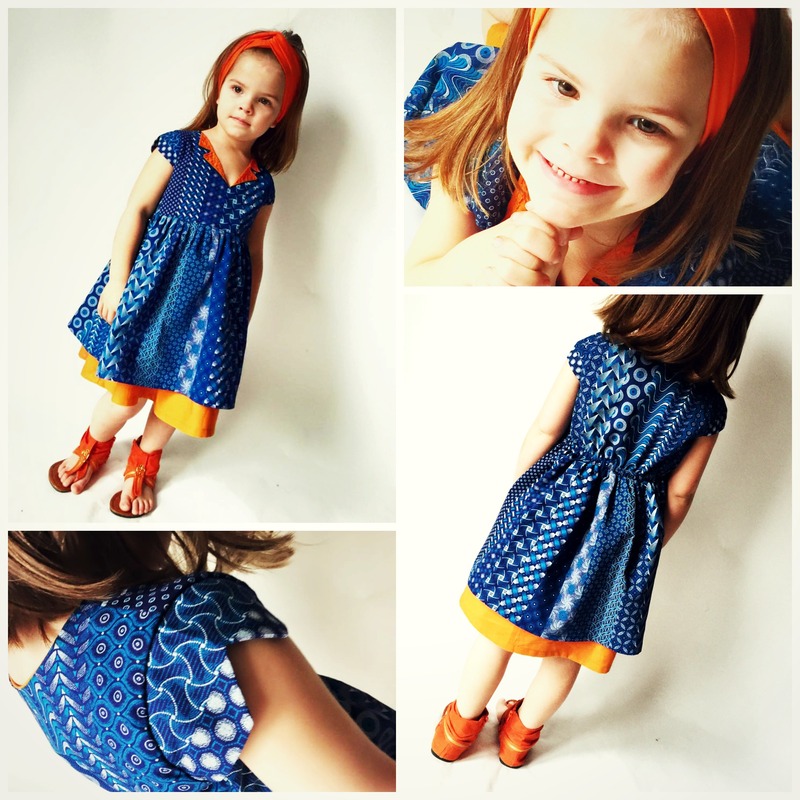 The dress works great in woven or knit fabric. The next one I made was the Yellow Eyelet and Teal chambray Verona that I already shared with you in my previous post. This one I did the short sleeve version with elastic. The eyelet makes for a beautiful Verona and make sure to follow Jenn’s suggestions for open and sheer fabrics. Next up was the Blue and orange Verona. I did the cap sleeve with this one and this sleeve is my personal favorite. I used Blue Shwe Shwe fabric from my stash that my lovely mother brings when visiting from South Africa . The underskirt is an orange Kona Solid. I added orange hand stitches to the collar to keep it in place but really am still deciding if I like it or not. Following was my personal favorite dress. Isabella has received many compliments from Adults that would love to have this as an adult version. 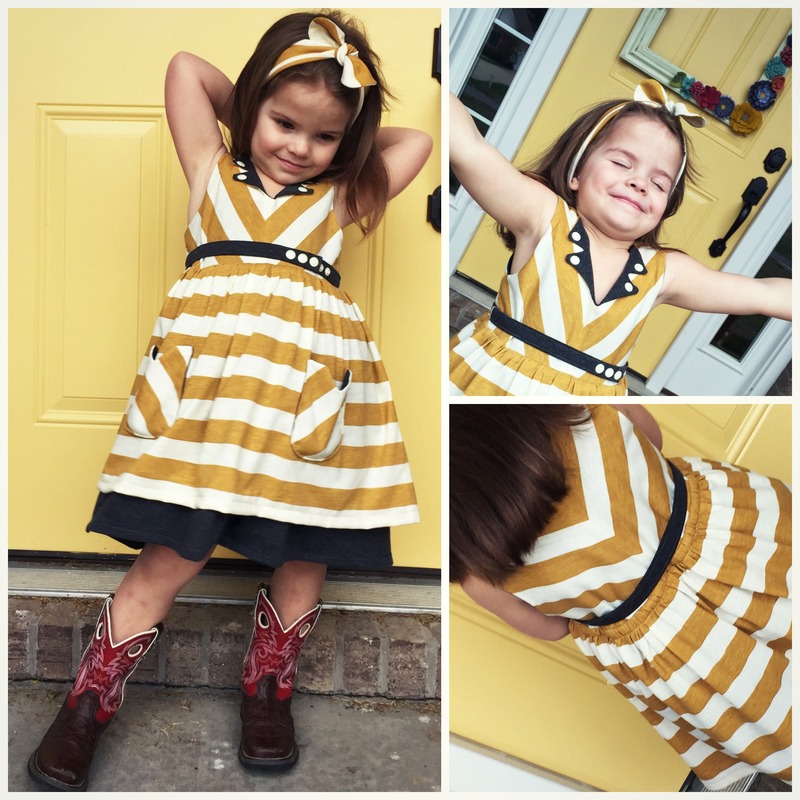 I used a Mustard and Ivory striped cotton jersey knit from Girl Charlee for the top and a grey knit also from Girl Charlee for the underskirt and bodice lining. I added the pockets for this version which I love with the knit. I made a belt with the grey knit and cream-colored kam snaps. I added kam snaps to the collar so I would not have to iron it after each wash and I have to say that this one needs no ironing when coming out of the tumble drier. Last but not least was a cap sleeve Verona for the Easter egg hunt at Church on Saturday. I added Tulle for this version and this just takes this dress up one notch and will please any Princess in your life. The bodice I created a faux double-breasted placket before cutting out my pattern by just folding and stitching to create the panel effect. For the skirt instead of gathering I made wide flat pleads instead. The fabric I used beautiful April Rhodes for Art Gallery, Wanderer, Serape Dream Premium Cotton from Fabricworm and a peach solid cotton for the bottom. 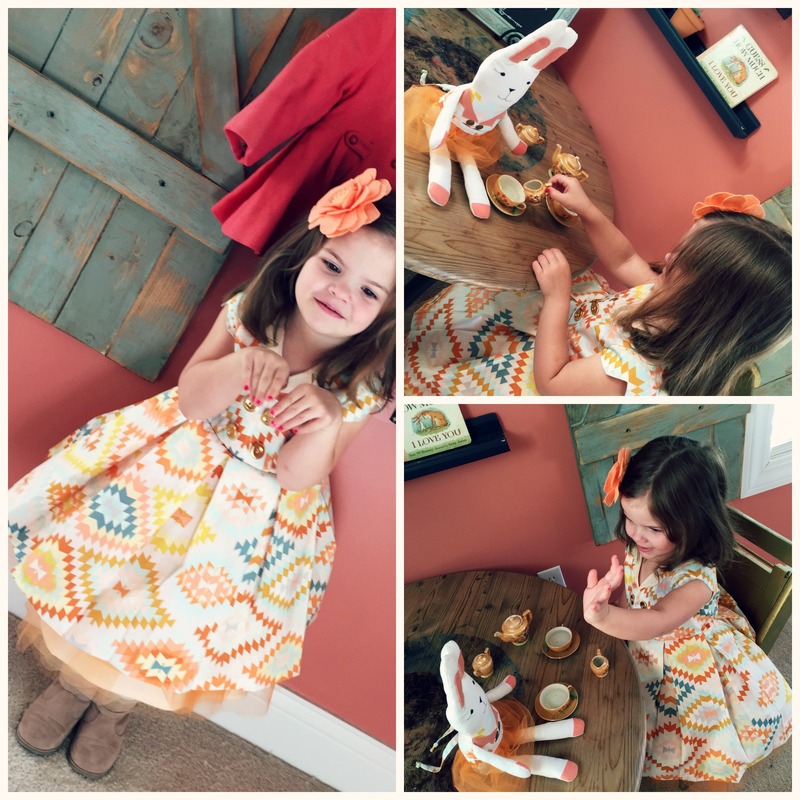 Isabella loves bunnies so I made a little easter bunny with leftover wanderer fabric and imitated the buttons and collar to go with her dress. I can truly say that both me and Bella loves all of the versions. Recommendations from me would be to make the correct size (check measurements and size when cutting out the pattern) and also make sure that the elastic is not too tight in the middle back or too loose ( I have found that the elastic guide on the pattern is a perfect fit on Isabella’s body) This will make for a beautifully fit and comfortable dress. I hope that if you do not have the pattern yet you go grab it while it is still on sale. Till next time – I hope that when I see you again I will be able to share some Boy outfit images with you………. All your dresses look wonderful! Isabella is adorable. 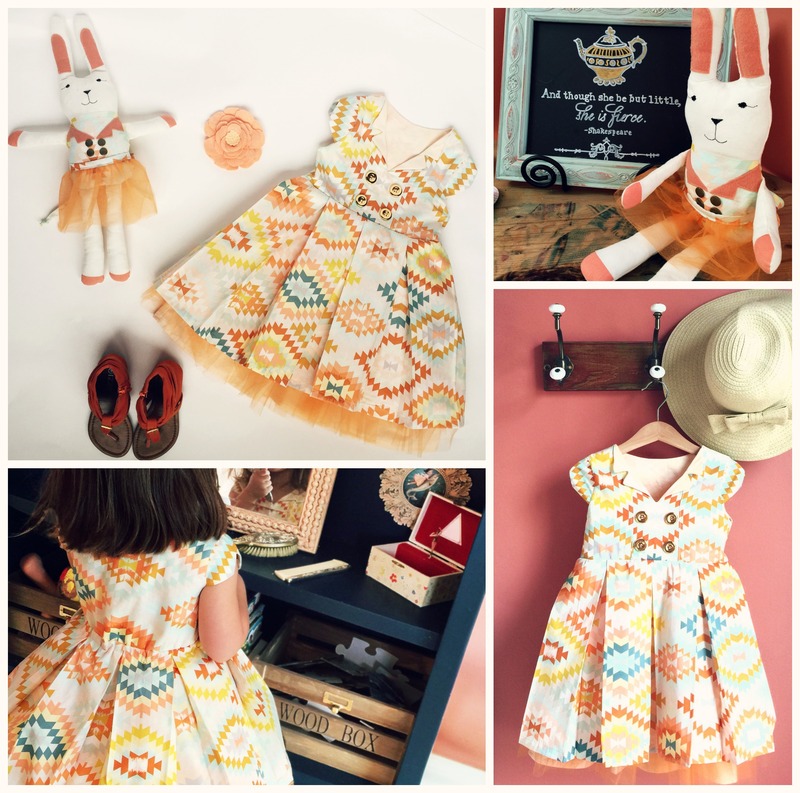 Wow – so many different and wonderful looks from the pattern. Your daughter looks great in every one of them.